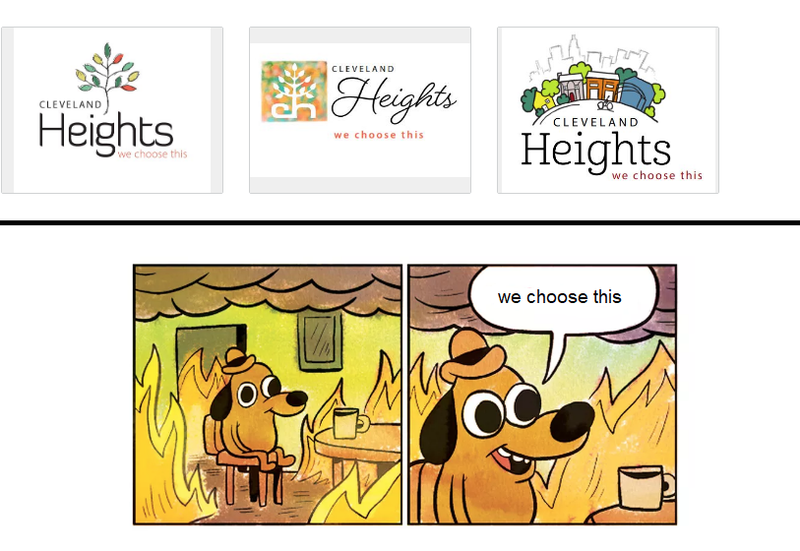 Cleveland Heights: We Choose This. 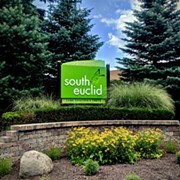 In the landscape of safe, vanilla and otherwise forgettable suburban slogans — including design and other visual branding, services for which Northeast Ohio cities are forking over from $10,000 to $100,000 recently and that include such insightful chestnuts as "Come Together and Thrive" (South Euclid) and "A Community of Neighbors" (Lyndhurst) — it's hard to pull off a clunker to the degree that it seemingly upsets almost everyone in the city, but Cleveland Heights appears to have scored a perfect 10.0 on this challenging maneuver. 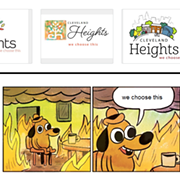 The reaction, expressed vociferously online, beyond general confusion as to what the slogan even means if you try to mine it for subtle notes of positivity, is that there's a distinct and almost explicit negative connotation: Hey, Cleveland Heights isn't great, but we choose to be here and we're dealing with it. Love it or leave it! And... that's not what happened. If you look at the full presentation from Align2Market, including field notes, survey results and input from community members, there's a very clear picture of what Cleveland Heights means to those who live and work in Cleveland Heights. Overwhelmingly, the most important values expressed were the city's diversity, creativity, arts and culture and its progressive soul. On the other side, concerns included taxes, crime and public education. The reconciliation of those comments came in two sentences in the PDF, and it's unclear whether they were written by the company itself or pulled from direct quotes from residents, though it's a safe bet that it's the former. "The 'sense of home' is so strong that deficiencies are overlooked or ignored." "It's not for everyone, but for some it's the only one." Cleveland Heights has always been the place where dreams dwell. Dreams of a welcoming garden suburb, a community that could open its heart to people of all incomes and ethnic backgrounds. Dreams of the kind of progress that carries us forward while remembering the best of the past. Somewhere in the background is Cleveland, with all of the energy a city has to offer. But Cleveland Heights is the oasis where we live. Cleveland Heights is where we dream. We can dream of a better world, where diversity is the value we treasure most. 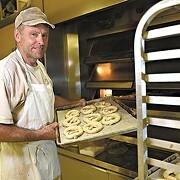 Where unique businesses reflect the personality of their owners. And our children can dream of being anything they want, in neighborhoods that seem to be powered by imagination. Our dreams have become a reality because of the choices we make. We choose to be different. We choose to be open. We choose to be accepting. And together we’ve chosen to create this special oasis that is Cleveland Heights. Which, again, works generically as a whole, but grabbing the walk-off line/conclusion without the rest simply doesn't work. Anyway, residents can now vote on which of three proposed logos will accompany the slogan. Get to voting. Why Are Cleveland Suburbs Branding, or Re-Branding, Themselves?